Weigh in: Web Apps or Mobile Apps? Hear ye, hear ye! : We may now be witnessing what is, for all intents and purposes, the dawn of a renaissance in application development — a return to the heyday of the once-ubiquitous web app. This was the thought running through my head when I heard about this morning's news from Amazon, which announced a new web app (Kindle Cloud Reader) that effectively turns every device you have into an eReader. Back then, just after the iPhone first debuted to huge demand, companies were desperate to grab a piece of the pie. Thing is, they had no way to make apps for it yet. And so they turned to the concept of web applications — the kind that kicks in when you visit a website to play a game or use an interactive feature. Even though web apps existed pre-iPhone, this turn of events gave it a sudden, enormous burst of interest, with seemingly everyone coming out with one. What happened after that is infamous: Apple launched and developed its App Store, and has since urged development into the dedicated mobile app space (meaning they encouraged software development for local applications residing directly on the device). Mobile apps became big, enormous in fact, across different platforms, stores and devices. These days, many developers can barely recall the glory days of the web app. it has become more like a relic that some companies may still use, but most consider kind of quaint. Well that was then (then = yesterday), and this is now (like, right now). When a major player like Amazon puts out a web app like the Kindle Cloud Reader, it gets noticed. And it will probably be mimicked — especially when you consider the reason why — Apple. Love it or hate it, it has a penchant for creating tidal waves of momentum in the mobile market, and its new policy this year seems to be flipping the industry on its head for the upteenth time. When Apple changed its iOS terms this year, many developers were appalled. Any iOS service app tied to a subscription was suddenly required to offer the subscription and related purchases in-app only. The backlash prompted a loosening of the restriction, but that was too little, too late for Amazon, which nixed in-app purchases from its iOS app. 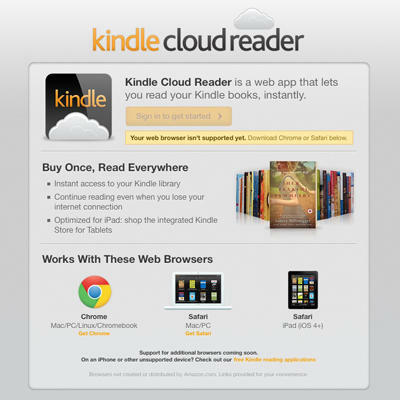 Now we know what it was up to — the Kindle Cloud Reader, a web app created and delivered on Amazon's own terms. (It even offers offline downloads, just like the full-fledged mobile apps.) The eBook giant is courting iPad users aggressively, and iPhone compatibility is probably being smoothed out as we speak. With this, Amazon has figured out how to bypass Apple's current (or even future) policies. If it becomes a hit, it's a no-brainer that others will follow suit — and probably not even just for iOS. If devs can prove that web apps are popular and sustainable today, why would they even bother with SDKs, market research into OSes or fragmentation issues? We could be looking at the beginning of a trend here … that is, if you the end users deem web apps worthy of flocking to, yet again. So what say you? Would you take to Amazon's new venture or any other web application, for that matter? Or given a choice, would you cling to dedicated mobile apps?